We woke early after a solid nights sleep. A nice cool morning greeted us as we headed to the 6am breakfast, back to our room to pack and we were off again. We had the roads pretty much to ourselves, few others were stirring before 8am. We passed a lot of agriculture, most fields looked recently cropped but some were still planted, cotton and soy bean were predominant. At some points we were just a few meters from the border wall, not the proposed Trump wall but the one that's already there. At one crossing point there were a lot of people crossing on foot, many looking like they'd been to the US on a shopping trip. For the second day we spotted helicopters trailing a contraption near the border. With no idea what it is we can only offer conjecture, either some sort of sonar looking for tunnels or maybe It's the Arizona version of a crop duster plane spraying crops.??? The town and crops gave way to desert, dramatic landscapes with the silhouette of jagged mountains as the backdrop. We stopped by the side of the road and checked out some tracks, it looked like small rodent feet of some sort being followed by large cat prints. Not long after being stopped by a border patrol check point we went through the jagged mountains and the speed limit went from 55mph to 75mph, 120kph, a very civilised speed for long straight roads. We saw a sign at an exit for painted rocks, petroglyphs so took the exit and 11 miles later we got there. It turned out to be a very interesting site with petroglyphs going back to between 7500BC and 1AD. There were also some interesting flowering cactus and a small lizard came out to see what we were up to as well. Back at the exit is a huge solar farm. We were stopped at a border check point but all it took was a cursory glance at our passports and we were on our way. 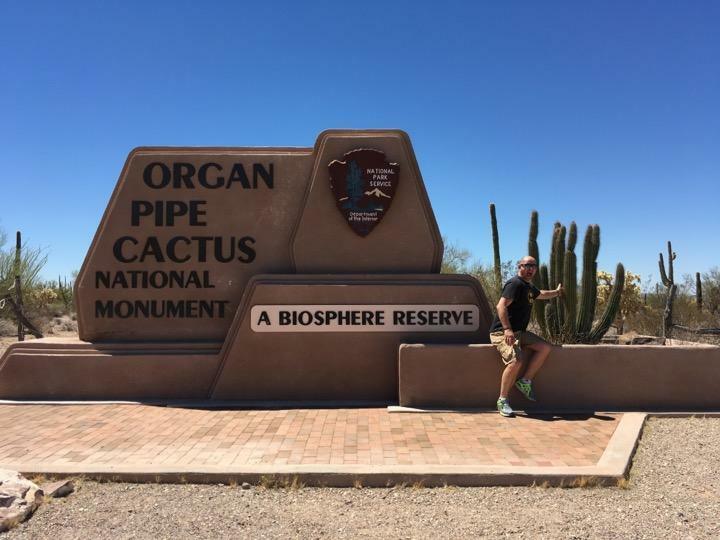 As we approached the Organ Pipe National Monument the temps hit triple digits. There was another border patrol check point just before the park began but we didn't need our passports this time, they were more interested in those coming from the other direction as the road leads to a crossing point. We dusted off off our annual National Parks pass and entered the park. With some info from the welcome centre we now know the names of the various cactus, mind you, that doesn't mean we can pronounce them correctly! We had lunch in a picnic area and took a drive around part of the park. With temps still hovering around the 100F mark we didn't do any hiking but still we got to see a great slice of the desert. Heading then to Tucson we had to go back through the check point and as we were potentially coming from Mexico were stopped. It was no big deal, passports, where you been, where you going sort of thing and we were off. Repeat at another check point. Wildlife spotting today, a fair few Eagles, lots of turkey vultures, couple of lizards, a squirrel and some sort of small rodent seen briefly dashing along the road before heading into the scrub to the side. We filled up again in Tucson $1.80/gal! Bargain, that's about $A.55c/lt, unbelievable! By 5pm we were checked in and settled in. Our suite at the Marriott is awesome, we could literally live in this place. A short trip to the supermarket and back to get a home cooked dinner of spice rubbed pork ribs and veg happening.